McGowan took to Twitter over the weekend, criticizing the women who are participating in the protest. Amber Tamblyn is speaking out against Rose McGowan after the actress slammed a proposed Golden Globes protest. Many actresses have decided to wear black dresses to the Golden Globes as a means of silently protesting sexual harassment and coming together in support of those who have been sexually harassed. However, McGowan took to Twitter over the weekend, criticizing the women who are participating. "Actresses, like Meryl Streep, who happily worked for The Pig Monster, are wearing black @GoldenGlobes in a silent protest," McGowan wrote in a now-deleted tweet. "YOUR SILENCE is THE problem. You'll accept a fake award breathlessly &affect no real change. I despise your hypocrisy. Maybe you should all wear Marchesa." Marchesa is the label designed by Harvey Weinstein's estranged wife, Georgina Chapman, who split from the disgraced producer following the many sexual misconduct allegations that went public against him in October. On Sunday, Tamblyn took to Twitter to respond to McGowan, slamming her for "taunting" the women coming together to silently protest. 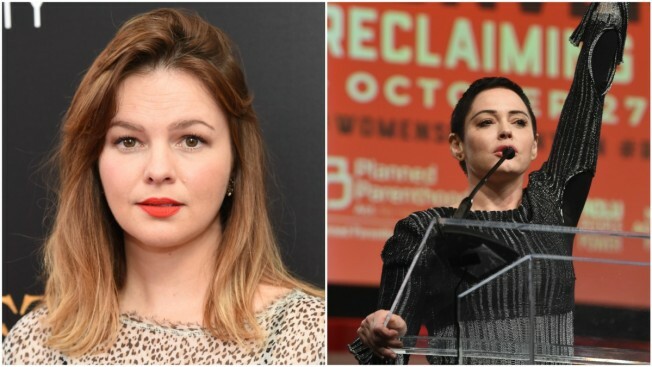 "Rose McGowan is a friend and while I support her kind of movement, I do not support any woman (or man) shaming or taunting the movements of other women who are trying to create change," the Sisterhood of the Traveling Pants actress tweeted. "Telling us to all wear Marchesa? This is beneath you, Rose." She continued, "You don't have to support and stand with us, but we stand and support you. You may take below the belt shots at us but we will not take them at you in return." Tamblyn went on to explain her thoughts regarding the importance of the protest. "Our movement is big. And a black dress is just the beginning of the darkness that will be drained from every industry across the country by the time we're done. That's a promise," she said. "And we stand together in this fight, shoulder to shoulder, weapon to weapon, woman to woman (and man), body to burned body. And our arms are open. And our hearts two fold. And our fire will be a universal scorch. Heed the mantra: #ChangeIsComing." Holly Marie Combs responded to Tamblyn's initial tweet, defending her former "Charmed" co-star and noting that Tamblyn should have reached out to McGowan privately. "You just did to @rosemcgowan what you claim you don't support her doing to others," Combs wrote. "Every activist for every cause the world over has different methods but share a common and more important message that should remain the same. And undiluted above all else." Tamblyn revealed that she did, in fact, speak to McGowan for "over an hour" and further explained why she felt the need to comment publicly. "Her statement was public and hurtful to some women so a public response was earned," Tamblyn wrote. "I spoke to her at length today, she knows how I feel. I love Rose fiercely, that will never change. To be critical of an action is not to condemn the person behind it. There's your common message."